I opened a book of mine today and out fell a piece of paper with the word Ahimsa. It fell into my hands at the perfect moment. Ahimsa is the first and foremost code of moral conduct upon which all the Yama’s and Niyama’s rest. Ahimsa, or nonviolence, asks us to step lightly, do no harm, and to honour the relationship we have with the earth, with each other and with ourselves. A small poem was attached to the word. “May I be gentle with myself today and easy with whatever comes my way; kind to all creatures I meet and with loving compassion for all I greet.” Patanjali’s Yoga Sutra is a value I live by. Yet, when people are caustic or rude, it is hard to hold up the latter aspect of this Yama. No doubt we all find ourselves in moments when reactivity takes the place of reason. When our insides feel a burning. Where we feel wronged and misunderstood. There is a deeper subconscious self that wants to say to those who hurt us “No, you have it all wrong! Stop and see yourself!” Then I realize that just as they cannot see themselves neither can I. Like a fish in water, they don’t know the water they are immersed in and neither can we have the clarity we wish to have. I was then taken to thoughts of Gandhi and how he fought for liberation through non-violence and his quiet defiance incensed people such that he was assassinated. A passionate, gentle, brilliant man, leading his people to equality and rights, ended up dead because of other’s opposing views based on misperceptions, projections and singular agendas. Are we really this fragile as humans? Are our minds so blind that we can become so inflamed to do such egregious harm to another? I was taught and believe that those who are challenging in our lives are our best teachers. I have also learned that with every interaction an individual teaches us about themselves. It is watching the actions of another that we learn so much. It is also in paying attention to our inner voice that we can observe how our own subconscious mind is triggered. We all have a past with ups, downs, twists, and turns. Our childhood history creates an embedded blueprint of the way the world works. Whether accurate or not, it is the foundation by which all present and future decisions are made. It is not right, it is only ours. To add complexity to this is the fact that many aspects of memory are captured implicitly whereby our subconscious is functioning with the information as though it were fact, but our conscious mind does not have access to specific recollection or understanding. I typically educate my clients that when they feel incensed, they are likely accessing an implicit memory and that they would be wise to slow down and take care of themselves. It is in these moments that our child self comes to bare and we need to manage our distress by taking care of that part of ourselves. Gandhi could feel his emotions and yet still drop into the quiet space between his thoughts to find Ahimsa. Through his deep meditation practices, he could access the silent voice of God to guide him. I then move to think of Victor Frankl, an influential psychiatrist who survived the Holocaust through his version of Ahimsa. Mr. Frankl was able to access this through the recognition that humans are both reactive and responsive. To obtain responsiveness, we must slow ourselves to disengage from the fight and flight centre of our brain. In so doing, we allow the incoming information to move to our response centre where we can access logic, reason and ethical decision making. Mr. Frankl was able to live by the fact that we do not have control over others, but we always retain control over ourselves. Now let us apply this to a situation where someone you are interacting with has lost sight of a rational narrative. This is the tough one, but there is a simple answer. We may feel hell-bent on correcting the story, but it will only polarize you more rather than move the interaction forward in a healthy manner. Instead, our only path is to find the kernel of truth in their narrative and to attempt to understand what they are feeling rather than get lost in details. So, are we this fragile? Perhaps instead of seeing this as fragility, we can acknowledge that this is the fierce way in which humans have survived. We had to react to stay safe. 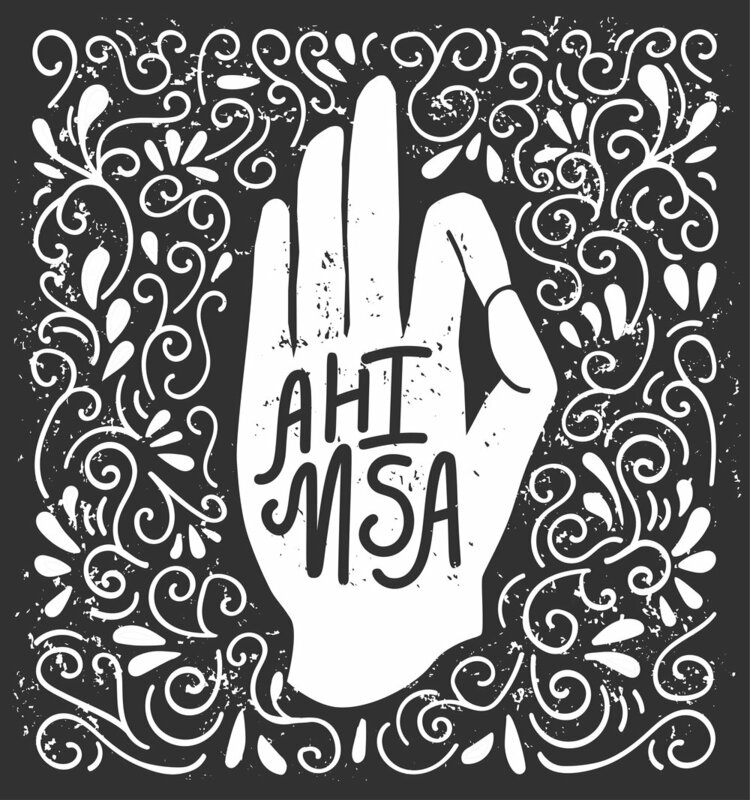 As evolved beings, we now have a chance to live with Ahimsa in our hearts and minds. Let this be so. This is my aspiring path. To listen to the silence. When I sense the wisdom arising I will be ready waiting with a dedication to Ahimsa. May you be at peace and free from harm. Older PostTime Heals They Say!